Healthy meal planning sounds great, right? But how in the world do you get started? With these handy tips, of course! Does the thought of planning and cooking dinner every night for the rest of your life fill you with dread? You’re definitely not alone. Let’s face it, when you’re committed to eating a healthy, whole-foods based diet, you spend more time prepping and cooking than you would if you just grabbed a TV dinner from the freezer or stopped for take-out on the way home. The benefits to your health are enormous, but we know it can feel like a chore sometimes. In light of this, we’ve put together some healthy meal plan ideas that will save you time, money, and a little sanity. 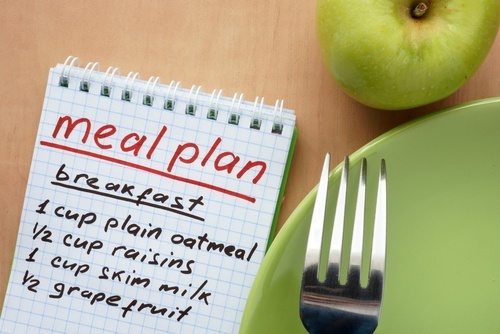 Assess: Your healthy meal plans for the week will vary depending on your schedule. Do you have a soccer game Tuesday night? Pencil in a quick and easy meal that night. Do you want to make extra to have leftovers for lunch the next day? Take a quick inventory of your family’s plans for the week, and figure out how many meals you need to plan and prep. Collect: Our best tip for healthy meal planning? Have a list of go-to recipes on hand! Use a binder or a recipe-keeping app to organize the tried and true recipes you rely on. Try one or two new recipes a week, and if they’re a hit, add them to your collection! Take Inventory: You know that basket of ingredients that chefs receive on “Chopped?” Whatever’s in the basket is what they have to use for their meal. Treat your pantry like that basket – do you have a lot of quinoa or canned beans in the cupboard? Find ways to use what you have. Also take advantage of seasonal eating. Is the Farmer’s Market awash in squash? Check out these squash recipes and eat up! Overlap: When you’re writing out your healthy meal plan, try to use recipes that overlap ingredients. If you’re roasting a chicken on Sunday – make a pot pie or chicken and dumplings Monday. Making turkey meatballs and spaghetti squash one night? Have meatball subs for lunch later in the week. Prep: After creating your healthy meal plan for the week and shopping for ingredients, take some time to prep. Chop fresh veggies and store in containers, or make some mason jar salads to have on hand for lunch. It’s ok to start small – trying to prep an entire week’s worth of meals when you’re just beginning may be overwhelming! Consider throwing together some slow cooker meal kits for super easy weeknight dinners. “Borrow” Some Ideas: Does planning out a whole week (or month) of grocery shopping and dinners all at once seem daunting? Lucky for you, there are plenty of healthy meal plan ideas online. Try out someone else’s menu! Complete with recipes and shopping lists, all the planning has been done for you. This can be helpful if you’re just getting started with meal planning or if you’re simply lacking inspiration one week. Whole Foods has several plans based around different eating styles, and ChooseMyPlate.gov provides two weeks of menus for healthy eating on a budget. Following these meal planning tips will help you avoid those pesky after work grocery store runs, while also giving a clear answer to the question, “What’s for dinner?” way ahead of time. Want more info? Check out our Recipe eBook (with a bonus food journal), or give us a call! Did we miss any of your favorite healthy meal plan ideas? Let us know in the comments!